The Cylinder was inscribed in Babylonian cuneiform (cuneiform is the earliest form of writing) on the orders of the Persian King Cyrus the Great (559-530BC) after he captured Babylon in 539BC. It is often referred to as the first bill of human rights as it appears to encourage freedom of worship throughout the Persian Empire and to allow deported people to return to their homelands. It was found in Babylon in modern Iraq in 1879 during a British Museum excavation and has been on display ever since. Neil MacGregor, Director of the British Museum, gave an interesting 20-minute talk on the Cyrus Cylinder at TED last year. The museum has posted a full translation of the inscription. Question: How much dirt does an archaeologist have to move? Actually, the answer to this question depends on the site. Sometimes an archaeologist only has to scratch the surface and the Early Bronze Age or some other ancient period is revealed. At other times, there is a massive amount of earth that has to be moved before the archaeologist gets down to the period he or she wants to study. Here is a good example. Our picture of the week, "Robinson's Arch," comes from a resource available ﻿through LifeInTheHolyLand.com, the sister site of BiblePlaces.com. The resource is called Picturesque Palestine, Volume I: Jerusalem, Judah, and Ephraim. It is part of the "Historic Views of the Holy Land" collection. This was originally a book that was published in 1881 and edited by none other than Charles Wilson, one of the most prominent explorers of the Holy Land in the nineteenth century. The book is a fascinating read as it discusses the landscape, holy sites, archaeological sites, and local culture as they appeared at that time. Robinson's "Arch" is really just the lowest section of what was originally an arch. It is called Robinson's Arch because it was discovered by Edward Robinson in the 1830s. You can see the remains of the arch on the right half of this drawing, towering above the two men and the oxen. The arch originally spanned across the Tyropean Valley in Jerusalem and formed the upper section of a long stairway that provided access to the Temple Mount during the time of Christ. (A reconstruction of this stairway can be seen here.) The Tyropean Valley was filled in over the years, beginning with the destruction of the Temple by the Romans in A.D. 70. Over the centuries the area was built up and torn down over and over again, accumulating debris until it looked like this in the nineteenth century. 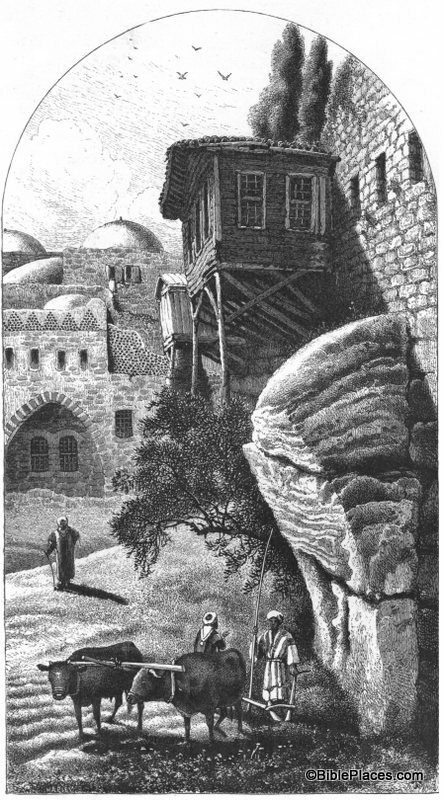 This picture (taken from the Jerusalem volume of the PLBL) is looking at Robinson's Arch from the opposite direction as the drawing in Picturesque Palestine. The arch is at the top of the photograph and circled in red in this photo. You can see that it now towers over the remains of the 1st-century street below. If you look carefully, there is a person standing on the street looking up at the arch. That gives you an idea of the massive amount of dirt and stone that had to be moved by the excavation teams in recent decades. This is just one example of the value of a work such as Picturesque Palestine. It allows us to roll back the clock and see how the land appeared to the nineteenth century explorers before the excavations of the last 100 years. This and other pictures of nineteenth-century Jerusalem are available in Picturesque Palestine, Volume I: Jerusalem, Judah, and Ephraim and can be purchased here. Additional historic images of the Temple Mount can be seen here and here on the LifeInTheHolyLand.com website. Several websites related to this topic can be found on the BiblePlaces website here. Wednesday, February 6, 2013: Florian Lippke (Universität Bern, Schweiz) "Comparative remarks on Late Persian iconography: The case of Samaria." Monday, February 18, 2013: Dr. Shimon Gibson (University of the Holy Land) "The Bethesda Pool Excavations, 1863 – 1967: A Re-assessment." All lectures takes place in the institute (Auguste Victoria Compound, Mount of Olives) at 5 pm. With the help of his two Turkish supervisors, Parker and his men claimed an area of ground near the entry to the Gihon water system, known at the time as the Virgin’s Spring, which was then fenced off and guarded by Turkish troops, who did not allow entry to any locals or other visitors. The Jerusalem Pasha Azmey Bey had been suitably bribed to turn a blind eye to the work. Parker’s activity naturally aroused the intense concern of the local archeological community. The Germans, French and British all had their missions in Jerusalem, but Parker would give out no communication and allow no inspection. His men proceeded with the digging, but they were amateurs and it went slowly and with little result. Back in London, the Finnish scholar Juvelius had hired an Irish medium, who studied the documents and sent directions to the team about suitable locations. He advised Parker to search the long water tunnel, so Parker sent to London to obtain the services of two mining engineers who had worked on the Metropolitan Railway, the first line of the London Underground. Then he made another excellent move. The full account is here. If you like stories like this, I recommend Neil Asher Silberman’s Digging for God and Country. The book is out of print, but still available in used bookstores. Having worked through the revised and expanded edition of the Pictorial Library of Bible Lands in this series, we will begin highlighting pictures in a lesser known (but extremely fascinating) series called Historic Views of the Holy Land. This is a sister collection to the PLBL and is featured in a website called LifeInTheHolyLand.com. The first bullet point relates to our "Picture of the Week." These are the maps created by the Palestine Exploration Fund in the 1870s and published as the Survey of Western Palestine. The maps contain an amazing amount of detail, were the most accurate maps produced in its day, and were created before the massive political and cultural changes were made in the country during the 20th century. Produced at a scale of 1 inch to 1 mile, these maps are a treasure trove for students and scholars interested in biblical geography. A full explanation of the maps and their value can be found here. Our picture this week focuses on one small area of the maps: the region of Bethel and Ai. This is just one example of the many uses of the Survey of Western Palestine Maps. 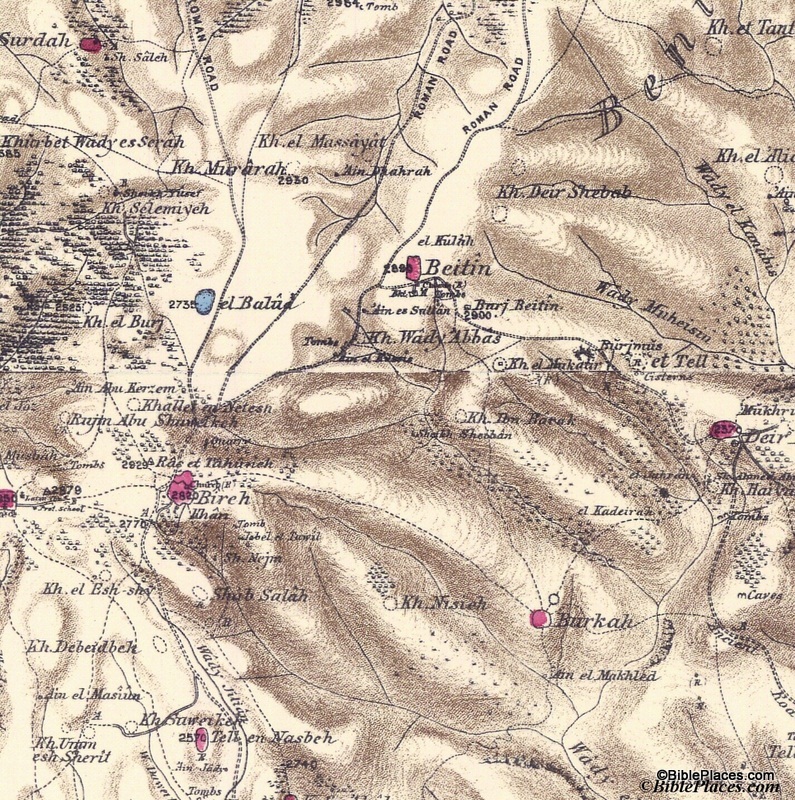 The originals of these maps are not easily accessible in libraries, but the electronic versions are available to all through the Historic Views of the Holy Land collection. 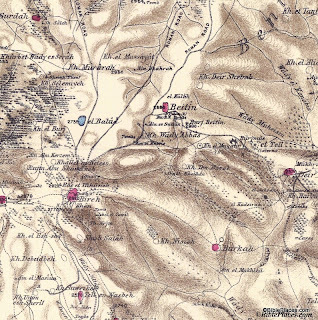 Further information and other images of the Survey of Western Palestine Maps can be found here. You can download the index to the maps for free here, and you can purchase the maps by visiting here. For another example of how these maps can be used, see my post on the Wild Olive Shoot blog here. 1:40 Jonathan Tubb, Keeper, Middle East, The British Museum, R.A.S. Macalister: Villain or Visionary? 2:25 Baruch Brandl, Israel Antiquities Authority, Are the Finds from Macalister's Gezer I-III Still Relevant for Current Research a Century Later? The workshop is open to all interested scholars. Please RSVP your intention to attend to Sam Wolff (sam at israntique.org.il). 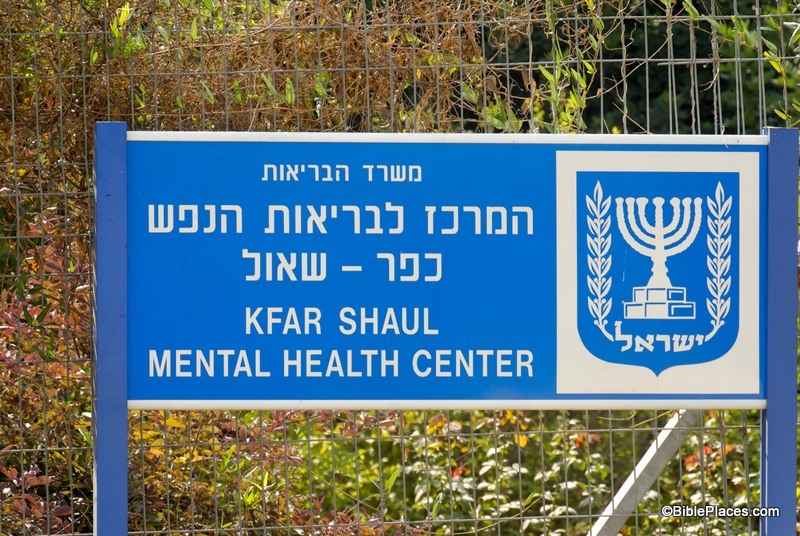 A press release from the American Friends of Tel Aviv University announces the recent discovery of a holy place that was not always a holy place. Tel Aviv University researchers have uncovered a unique 11th-century BCE sacred compound at the site of Tel Beth-Shemesh, an ancient village that resisted the aggressive expansion of neighboring Philistines. The newly discovered sacred complex is comprised of an elevated, massive circular stone structure and an intricately constructed building characterized by a row of three flat, large round stones. Co-directors of the dig Prof. Shlomo Bunimovitz and Dr. Zvi Lederman of TAU's Sonia and Marco Nadler Institute of Archaeology say that this temple complex is unparalleled, possibly connected to an early Israelite cult — and provides remarkable new evidence of the deliberate desecration of a sacred site. After ruling out the use of the site as a domestic structure, the researchers knew that they had found something unique. Excavations revealed almost only shards of painted chalices and goblets found spread on the floor but no traces of domestic use. One of the three flat stones was surrounded by animal bone remnants, and the two other stones were seemingly designed to direct liquids. These clues convinced Prof. Bunimovitz and Dr. Lederman that they had uncovered a likely place of sacred worship. But the temple didn't remain sacred. Samples of earth taken from layers above the destroyed temple and analyzed at the Weizmann Institute of Science revealed astonishing results. Directly above the temple was a packed-in layer containing phytoliths (remains of weeds that are commonly eaten by livestock) and spherulites (microscopic remnants of manure produced by grass-eating animals), indicating the presence of animal pens directly on top of the sacred site, explains Prof. Bunimovitz. Intermittent burning in order to clean the pens likely resulted in the concentrated state of the layer. This desecration was no accident or coincidence, the researchers believe. Instead, it represents the see-saw of political might between the Philistines and the local population. Presumably the Philistines gained temporary control of Beth-Shemesh, and brought in livestock to live on what they knew had been a sacred site to their enemies. The article does not mention Samson, but this is roughly the period when he lived in the town across the valley. Logos Bible Software, my Bible study program of choice for more than 15 years now, has released version 5. The Biblical Studies and Technological Tools blog is reviewing it. In Part 1, Mark Hoffman provides excuses for upgrading, and in Part 2, he gives reasons, with plenty of illustrated examples. A new 3-minute video produced by Azusa Pacific University should certainly capture interest and motivate volunteers for the new excavation at Abel Beth Maacah. You might consider showing it to a class or other interested group. Perhaps the most curious volume in the revised and expanded Pictorial Library of Bible Lands is the last one: Volume 18, "Signs of the Holy Land." 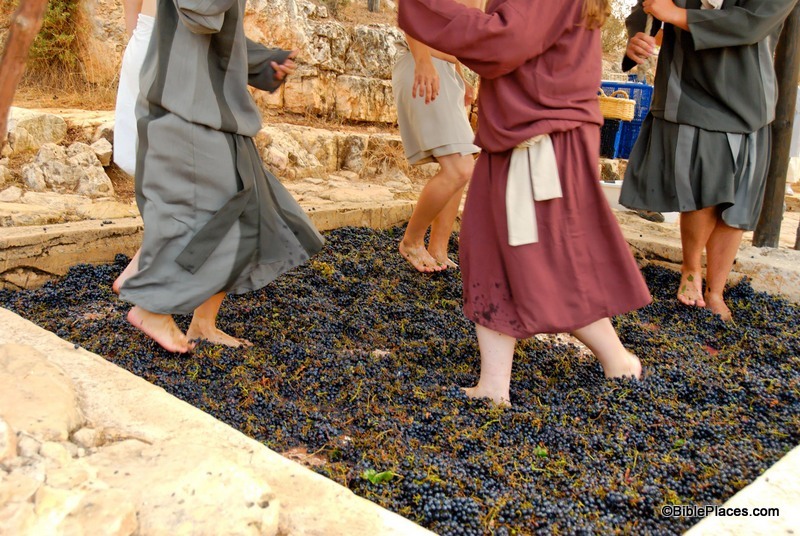 If you have never visited the Holy Land, then you don't know what you're missing! 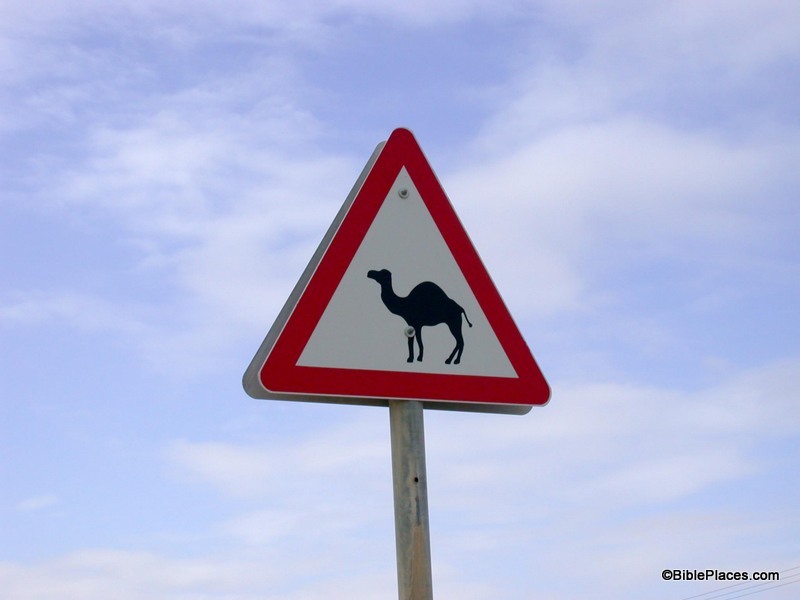 If you have been there, then you can imagine what humorous (and not-so-humorous) signs you can find in this collection. Perhaps we are not as far removed from the time of Abraham as we think we are. Yet much of their charm comes from the fact that these are modern signs that often reference biblical people, places, and events. One of the values of visiting the Holy Land is that it helps you connect with the Bible in a unique way because you are there. You are in the same place where the drama of the Bible unfolded. 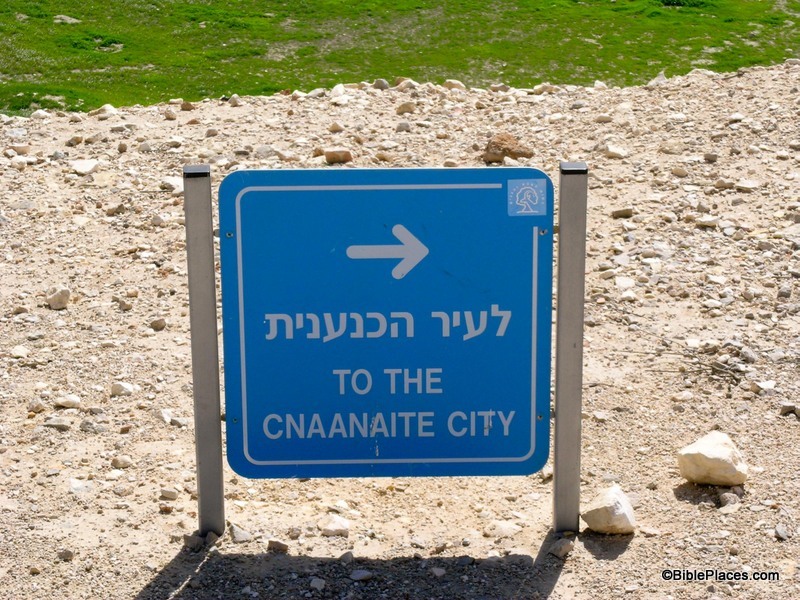 Seeing road signs that reference the cities of Jerusalem, Bethlehem, Jericho, Nazareth, Tarsus, or Corinth drives home the point that you are in the land of the Bible. You also will see streets and shops named after biblical events or people. If only this place had existed in Saul's day then maybe he wouldn't have needed to hire David to play music for him (1 Sam. 16:14-16). I'm sure the readers of this blog can think of more uses than that, and you are welcome to leave your ideas in the comment section. Until next time ... drive safely, watch out for passing camels, and (as one sign in Cyprus puts it) remember that "Driving in the lake is forbidden." These and other photos of "Signs of the Holy Land" are included in Volume 18 of the Pictorial Library of Bible Lands and can be purchased here. According to Yotam Tepper, excavation director on behalf of the Israel Antiquities Authority, “What is clear is that after these unknown individuals fell into the well it was no longer used for the simple reason that the well water was contaminated and was no longer potable”. Tepper adds, “The impressive well that was revealed was connected to an ancient farming settlement and it seems the inhabitants used it for their subsistence and living. The upper part of the well was built of stones and its lower part was hewn in the bedrock. Two capstones, which narrowed the opening, were set in place at the top of the well. It is c. 8 meters deep and its upper part measures about 1.3 meters in diameter”. Tepper says, “Numerous artifacts indicating the identity of the people who quarried it – the first farmers of the Jezreel Valley – were recovered from inside the well. The finds include, among other things, deeply denticulated sickle blades knapped from flint which were used for harvesting, as well as arrow heads and stone implements. The excavation of the accumulations in the well shaft yielded animal bones, organic finds and charcoal which will enable future studies about the domestication of plants and animals, and also allow researchers to determine the exact age of the well by means of advanced methods of absolute dating”. 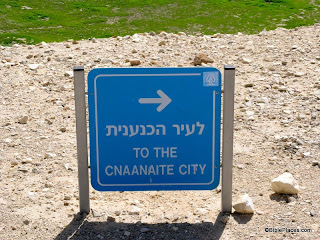 ‘Enot Nisanit is located one mile north of Tel Megiddo. The full press release and six high-res photos are here. Well discovered in Jezreel Valley. Photo by Yotam Tepper, courtesy of the Israel Antiquities Authority. Skeletal remains discovered inside well. Photo by Clara Amit, courtesy of the Israel Antiquities Authority. Excavations are underway now at ancient Carchemish. We’ve commented on the plans previously here. I really like how Wayne Stiles takes our photos and creates beautiful articles that explain the biblical history so well. This week he writes about the tabernacle at Shiloh. James Davila points to a new article on the metal codices from Jordan and explains why he thinks they’re still fake. Some of these beams predate the first Al-Aqsa Mosque and have been used and reused numerous times in various structures, which actually aided their preservation. We have some fragments of these beams among the finds at the Sifting Project. 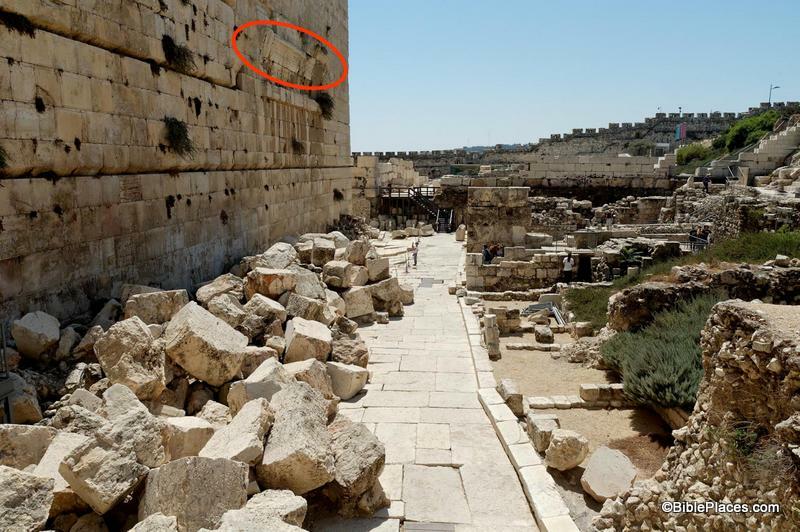 We have been monitoring these beams for many years as they lay exposed to the weather in the open courts of the Temple Mount. We hope the Israel Antiquities Authority will succeed in placing them in a safe shelter before the coming winter. We have been requesting that the IAA deal with this issue more than three years, but these ancient beams have yet to be properly secured. Arutz-7 reported on Sunday that some of the beams are being used as firewood. The wood, consisting of giant beams, first appeared at the end of the 1930s, when the Al-Aqsa mosque which currently occupies the Temple Mount was refurbished. The beams had been used in the roof structure of the mosque, and already at that time they were said to be thousands of years old by archaeologists – preserved only because they had been used in the building. Some of the beams were dated to the first Temple period, others to Roman times, and at least one beam was found to have Byzantine-era designs etched on it. Now, many of the beams have been placed at what appears to be a dumping ground next to the Golden Gate of the Old City, apparently for the use of local Arabs as firewood. Jewish groups that visited the Mount saw the beams being moved, but reported that the Arabs forbade them to take photos of the activity. Officials of the Archaeology Authority, who are responsible for the safety of these ancient beams, are nowhere to be seen. The Arutz-7 story includes a short video allegedly showing the beams being burned next to the Golden Gate.